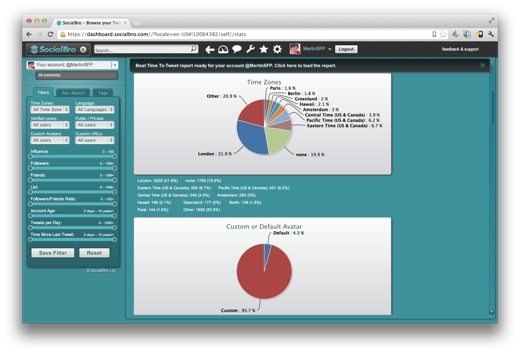 SocialBro is by far the best tool I’ve found for managing my Twitter account. From identifying abandoned accounts to unfollow, to finding out which timezones and languages my followers use and the best time of day to tweet, SocialBro reveals it all and more. The problem with SocialBro until now has been that it was only available as an Adobe Air or Chrome app that stored data about your account locally. From today, the service is available in any browser, with data stored on the Spanish startup’s servers. This means that you can log in from anywhere to get a great overview of your Twitter account without having to start from scratch by re-indexing everything on each machine. 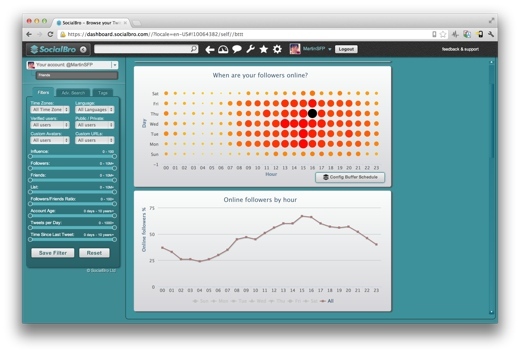 This is important because SocialBro keeps data about how your Twitter account changes over time and plots it on graphs. Until now, each installation on a different machine would have to rebuild that from scratch. Backed by Seedcamp, SocialBro is aimed largely at brands, and the new cloud-based version reflects this by only being available for a monthly fee with tiered subscription pricing depending on the number of accounts you want to manage and other factors. The desktop version remains free to use, however. A large number of well-known companies, like CBS, NASCAR, Coca-Cola and T-Mobile all use it, and their social media managers will presumably welcome in this latest development for keeping track of their progress on Twitter from anywhere.